How can waterfront condominiums be shaped by the history of the naval shipyard that came before them? 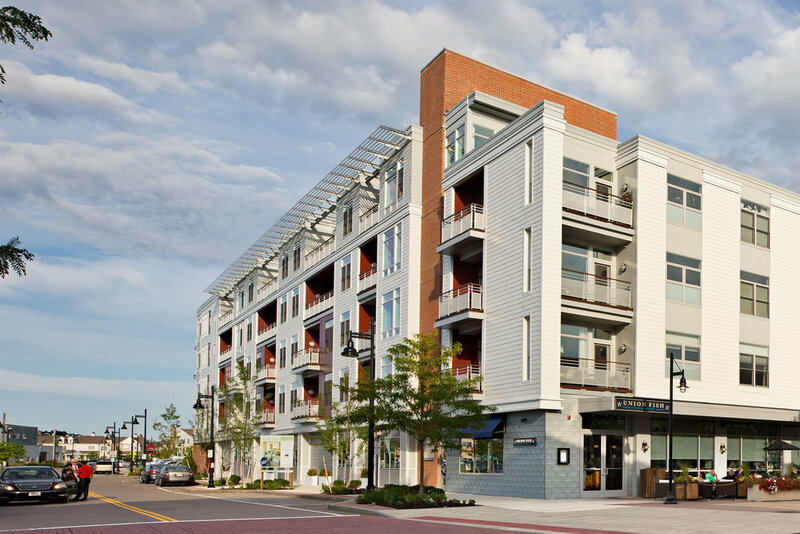 Once the site of World War II naval shipbuilding, the redevelopment of the Hingham Shipyard presented an opportunity to explore the intersection of past and present through three condominium buildings. These buildings, located within a new mixed-use development of retail and parks, position themselves at the water’s edge, capturing views and creating a visual backdrop to the boat-filled marina they overlook. Material cues are taken from the metal-plated hulls of WWII naval ships, the clapboard hulls and mahogany trim of old sailboats, and the brickwork of former industrial buildings. This contextual palette creates a dialogue between building and boat; materials visually organize the building facades with rhythms following the marina docks and patterns reminiscent of ship hulls. Each of the 92 living units is individually connected to the landscape, water, boats, and sunsets of the shipyard. Jason Hart served as the Project Architect and Manager while working for DiMella Shaffer.